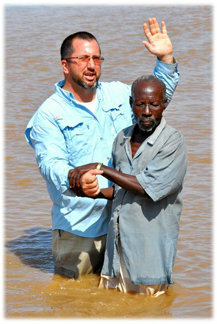 About Turkana Missions, Kenya, East Africa Home Church South Union Baptist Church. Yea, so have I strived to preach the gospel, not where Christ was named, lest I should build upon another man's foundation. I am Eddie "Ekiru" Williams. I am the fifth generation of my family raised in Sumter County, Florida. I graduated from South Sumter High School in 1991. When I was 17 years old, I was saved and surrendered to preach through the ministry of St. Catherine Baptist Church (now Providence Baptist Church) in Bushnell. I have been blessed with two daughters. My eldest is Breanne. She graduated from SSHS in 2013 and is currently continuing her studies at the University of South Florida in Tampa. My younger is Michaella, aka Bug. She is in her senior year at SSHS. They have grown up in my hometown of Bushnell and are faithful members of their church. My girls came to see my work here in December 2013. They fell in love with the people and the Turkana people fell in love with them. I thank God for the testimony and the heart of my Christian children. In 1993, I graduated from Florida Baptist Schools (now Emmaus Baptist College) and was called to the mission field of Kenya in May 1998. I moved to the field in February 2000 and have lived in Nairobi, working in the slums of the city; in Western Kenya, working in the rainforest with the Luhya tribe; and in 2005, among Kenya's forgotten tribe, the Turkana. I was given a local name, Ekiru, which means "rain." For a people who live in such a dry and thirsty land, I consider this a high honor. My home church is South Union Baptist Church in Daingerfield, Texas, which is pastored by Chad Thompson. In Turkana, our ministry is to preach the Gospel of Jesus Christ while equipping His disciples through education and experience to establish New Testament churches. This is partly accomplished through the Landmark Baptist Bible Institute in Turkana and adult literacy programs in our churches. South Union Baptist Church asks you to pray for our ministry in Turkana and to help the work there by giving of your talents for VBS, time for construction projects, knowledge for medical campaigns, and with financial support. You can learn more about us as a church by visiting our Facebook Page. Every man according as he purposeth in his heart, so let him give. To open their eyes, and to turn them from darkness to light, and from the power of Satan unto God. All can PRAY, Many can GIVE, Some can GO, to TURKANA!